CrossTech announced that a CrossRef working group has written a best practices for the use of RSS feeds by publishers. Nice introduction for anyone who is creating RSS feeds. Only comment I could make, is the lack of other modules. For example, a Chemistry module has been proposed by us 5 years ago already (DOI:10.1021/ci034244p) and about which I blogged on several occasions. 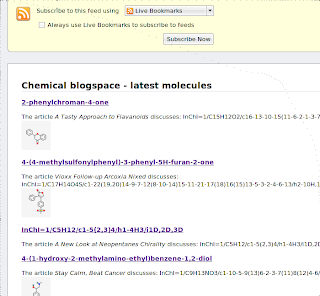 Below is the CMLRSS feed of Chemical blogspace. Of course, publishers can take advantage of such modules, using the XML Namespaces technology. The best practices uses that for a Dublin Core and a PRISM extension. The here discussed CML extension is another one, but the point is, that you can basically plug in any module.